One of the first things we learn about the brain is that it’s in charge of the rest of the body. It not only allows us to imagine rainbow unicorns fighting an epic battle against giant robots, but it also processes outside stimuli and allows us to react to them. The brain also micromanages the functions of our bodies without consulting our “conscious” minds — that’s probably a good thing since even the biggest control freaks among us don’t want to have to tell each of our 86 million neurons when to fire or how to connect with each other. If we had to do that we wouldn’t have the time or energy to think about anything else! We do, however, give more general commands to our bodies: put your left foot in, put your left foot out, put your left foot in and shake it all about, etc. But how do we get from intention to action? That’s what we’re going to be talking about today. The nervous system and the muscles have a close and complex relationship, translating electrical impulses from neurons into physical movements in the outside world. Let’s start at the top — and yes, I mean that literally. 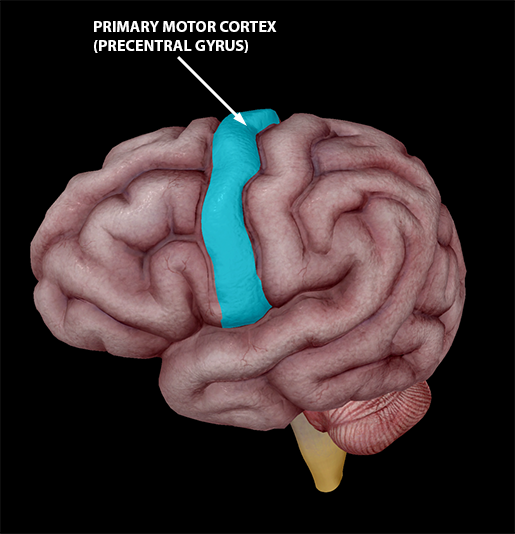 Part of the primary motor cortex (precentral gyrus) is pretty much at the top of your head. The primary motor cortex is responsible for voluntary muscle movements, and portions of it correlate to different areas of the body. 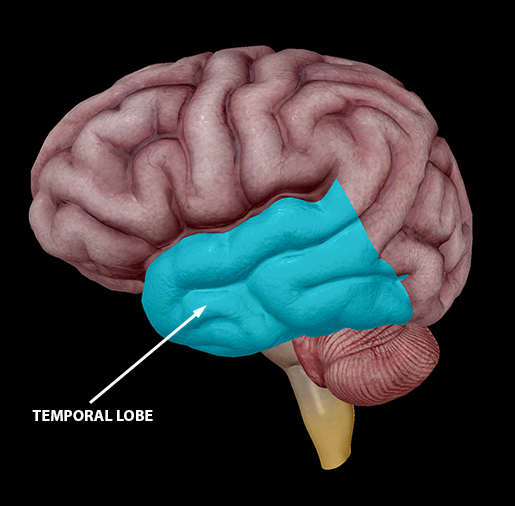 Here’s a more detailed map of which motor cortex areas map to which areas of the body — it’s called a homunculus, Latin for “little man.” This mini-person has some pretty weird looking proportions, but that’s because areas of the body that perform more complex motions get more space in the motor cortex. Let's say you want to move your leg. Neurons in the “leg” part of your motor cortex will send a signal out to your body via a motor pathway called the corticospinal tract. In the corticospinal tract, the axons of upper motor neurons extend from the motor cortex to the spine, where they connect with lower motor neurons (neurons with axons extending from the spine to other areas of the body). Lower motor neurons are the ones that actually interact with muscle fibers, and we’re going to focus on that interaction in the next section. Innervation and movement of the deltoid (middle head). 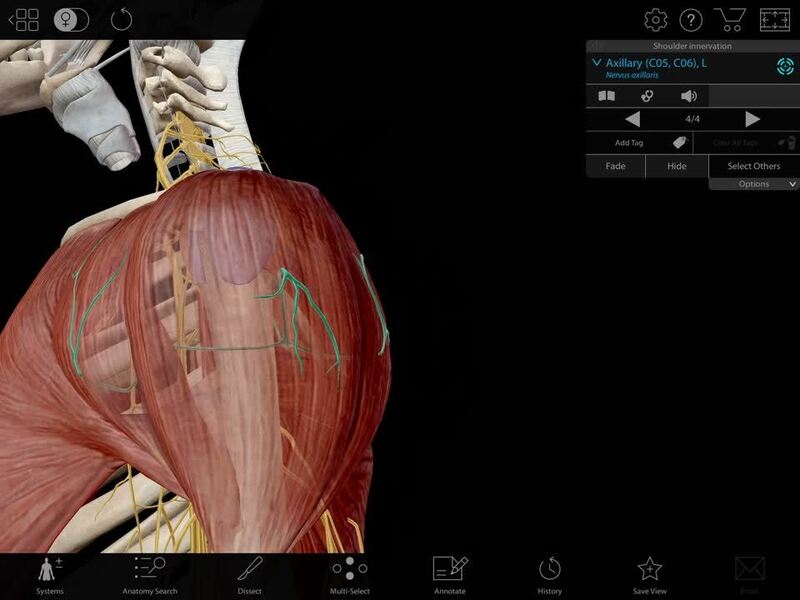 Video footage from Human Anatomy Atlas. Before we do that, here are some interesting facts about injury to upper vs. lower motor neurons. When upper motor neurons are damaged, voluntary control over muscles becomes more difficult. Reflexes can become hyperactive (hyperreflexia), and muscles can remain in a state of continuous contraction (spasticity). In contrast, when lower motor neurons are damaged, symptoms can include hypo-active reflexes (areflexia), loss of muscle tone (atrophy), tiny muscle contractions called fasciculations, and even paralysis. Now we’re going to take a closer look at the relationship between the nervous system and the muscular system by examining how the impulses of neurons are translated into muscle contractions. 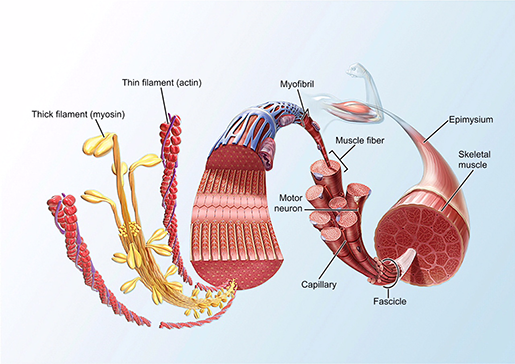 Skeletal muscles are made up of fascicles, which are bundles of muscle fibers (muscle cells). Each muscle fiber is a bundle of myofibrils, and each myofibril is a bundle of of myofilaments. Want to know something cool? Whereas most somatic cells have only one nucleus, skeletal muscle cells have multiple nuclei. this is because embryonic cells called myoblasts fuse together during development to form individual skeletal muscle fibers. The grouping of one motor neuron and the muscle fibers it innervates is known as a motor unit. A single motor neuron usually innervates more than one muscle fiber, since the motor neuron’s axon can have multiple terminals at its end. Motor units can be as large as a few thousand muscle fibers to one neuron, but motor units of this size usually only occur in parts of the body that don’t engage in fine, precise movements. For example, your leg might contain large motor units but your hands wouldn’t. The place where a neuron makes contact with an individual muscle fiber is called a neuromuscular junction. The neuromuscular junction is basically a synapse: the neuron releases a neurotransmitter called acetylcholine (ACh) which binds to receptors on the sarcolemma (the cell wall of the muscle fiber). This triggers the diffusion of Na+ ions into and (some) K+ ions out of the muscle fiber, creating a more positive charge inside the muscle fiber than there is outside. Channels open along the sarcolemma to allow sodium and potassium ions to move in and out of the cell in a cycle of depolarization (Na+ floods in) and repolarization (some K+ leaves the cell, the voltage-gated channels that were allowing Na+ in close, and Na+ is pumped back out). If this all sounds suspiciously familiar to you, you may have studied action potentials in neurons before. And your suspicions are correct — an action potential is exactly what this is. The action potential eventually activates the release of Ca2+ ions from the structures that store them into the sarcoplasm (the muscle cells’ equivalent of the cytoplasm). These calcium ions are the key to the actual contraction of the muscle fiber. Each muscle fiber has two kinds of filaments: thin filaments (a combination of actin and other proteins) and thick filaments (mostly myosin). Calcium ions bind to the proteins covering actin binding sites on the thin filaments, changing their shape to expose the binding sites. Myosin heads, the knobby looking bits on the outside of the thick filaments, can then attach to them. This all occurs in multiple sections of the muscle fiber called sarcomeres. When the myosin heads attach to actin's binding sites, the actin filaments are pulled towards the center of the sarcomere. You know that your muscles need energy to function. Here’s where that energy comes in: ATP molecules are required to break the bond between myosin and actin. Once the bond is broken, the whole contraction process (attach, pull, release, and reset) can occur on loop until there are no more calcium ions or until there is no more ATP available. When your body moves, your neurons are sending repeated signals to the muscle fibers in their units, telling them to keep on contracting. More motor units are activated when you are performing an action that involves more force. For example, lifting a huge sack of flour would require the activation of more motor units than lifting a paperclip would. There are probably things you do that make you feel like your body’s on autopilot — walking, driving a car, dancing the Macarena, you get the picture. If the control of skeletal muscles is voluntary, why are actions like this easier than jumping on one foot while juggling knives (please don’t try this at home)? The answer is muscle memory, though that term is a bit misleading. Your muscles aren’t the ones doing the remembering. After all, literally all they do is contract or not contract. Your nervous system is the master of all things memory. However, your brain isn’t remembering how to do practiced physical actions in the same way it remembers the phone number for the local pizzeria or the conversation you had with your best friend last week. Those last two are examples of declarative and episodic memory, respectively. 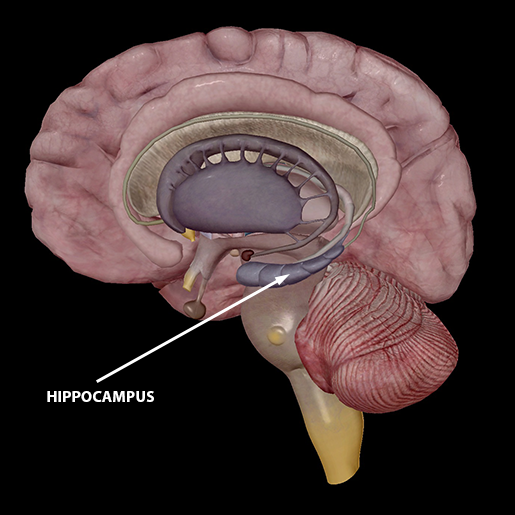 Both declarative and episodic memory are examples of “conscious” memory, which primarily involves the temporal lobe and the hippocampus. 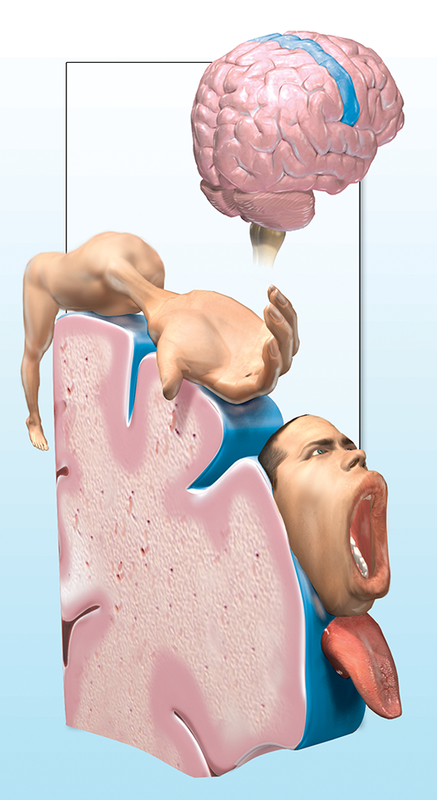 Images from Human Anatomy Atlas. So-called muscle memory is actually procedural memory, the kind of “unconscious” information your brain stores and accesses. Procedural memory makes use of the primary motor cortex, basal ganglia, and cerebellum, the usual suspects in motor activity and motor learning. The professor of my neurodevelopment class always told us that “neurons that fire together wire together,” and that’s pretty much how I like to think about motor skill learning. The actions that are close to automatic are the ones you practice (or just do) all the time. When you perform an action repeatedly, your neurons get used to firing in the pattern that corresponds to that action, and so your neural pathways change over time to make the whole process more efficient. Did you know that practicing a skill can change the structure of your brain? MRI studies in which subjects were taught to juggle have found that, following training, the jugglers had increased white matter connecting visual and motor areas and increased grey matter in areas of the brain that involved visual information about objects in motion. The motor “mapping” in the primary motor cortex is also subject to change with practice. For example, as a cellist, Yo-Yo Ma would have a larger area of the motor cortex dedicated to his left hand than someone who doesn’t play a stringed instrument. Even brain activation patterns change as you become more skilled or experienced at performing a particular action. 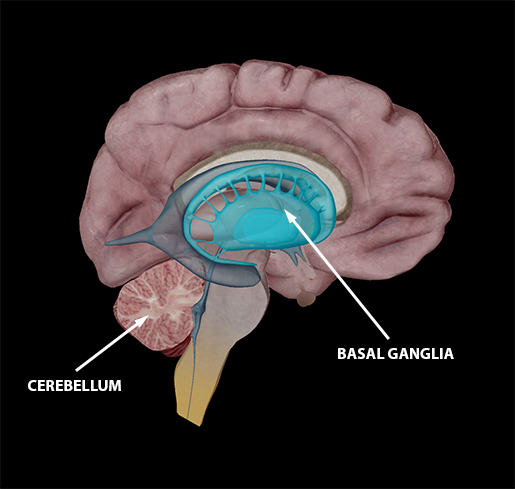 Activation in the pre-motor cortex and basal ganglia decreases as a skill becomes more “automatic,” while activation in the motor cortex and cerebellum becomes more focused (that is, less spread out). So, what we mean when we say “muscle memory” is actually “procedural memory,” brain-wise. However, research indicates that there might be a more literal version of muscle memory after all. Muscles that have previously undergone training are more easily restored in strength and volume after prolonged inactivity. Check out this study if you’re interested in learning more about the epigenetics that make this kind of muscle memory possible. And there you have it — the basics of neuromuscular interaction, from motor control to the mechanics of muscle contractions to motor learning. If you’d like to know more about the nervous system and the muscular system, explore our Learn Site!